New Albany, MS– The New Albany Elementary School NAES Pre-K program has always been known in the community as outstanding. 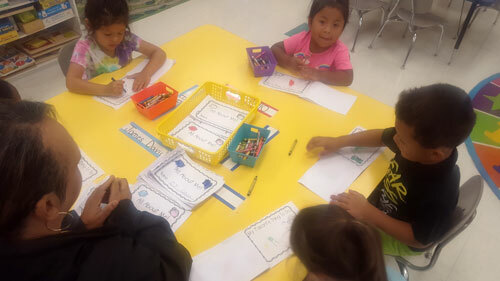 Once the children leave the Pre-K program they are well prepared for kindergarten. This year the program added two certified teachers to the program, Emilee Stubblefield and Lisa Topper. Both of these teachers have taught kindergarten for several years and are very excited about the changes that the Pre-K program will offer. Both certified teachers are highly qualified as Topper is National Board Certified in Early Childhood and Stubblefield has achieved her early childhood endorsement by successfully passing the Praxis assessment. MDE has set curriculum guidelines stating that a research, evidence based comprehensive curriculum that is designed to prepare children to be ready for kindergarten be used with Pre-K students. It is recommended that there is an emphasis in early literacy and the curriculum be aligned with Mississippi Early Learning Standards. The New Albany School District has made it possible for each NAES Pre-K class to receive a state approved curriculum, Pearson’s O.W.L (Opening the World of Learning) curriculum. “Weare using this curriculum as a guide so that the Early Learning Standards are targeted through all lessons and learning center activities that are used throughout the thematic units,” explained Topper. The Pre-K experience will allow students to grow vocabulary, build community, and learn problem solving techniques. Planning for the classroom experience is intentional and requires extensive preparation. Each classroom plans for a minimum of five learning centers that is organized and prepared with meaningful content. The children will have access to these learning centers for 120 minutes each day. During this time, the children have opportunities for hands-on learning at individually appropriate levels. The day begins with students entering the school each morning and going to their classroom on the kindergarten hall. They have already been taught the morning routine of hanging up their backpacks, putting folders up, and signing in. Children then move to the cafeteria to eat a well-balanced breakfast and are learning how to socialize with peers, as well as appropriate table manners. Once the students are back in the classroom, the morning consists of morning meeting, literacy circle, learning centers, music and dance. 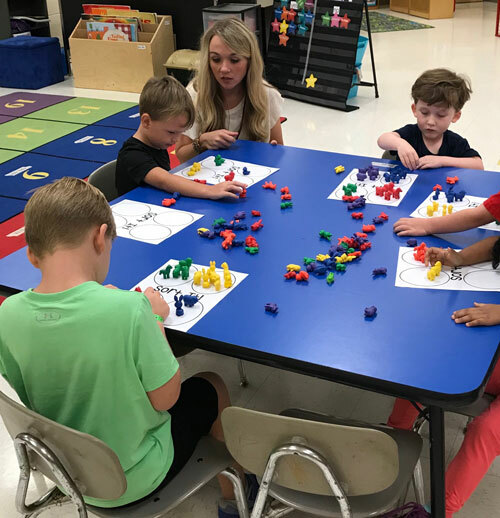 The Pre-K classes are fortunate enough to be activity involved with the kindergarten classes for rotation such as health, Integrity, physical education, music, library, and technology. Students go to a different rotation each day along with kindergarten students. The remainder of the morning time involves lunch and recess. Every aspect of the day has intentional learning taking place. During meals the students are learning social skills, coping skills and problem solving. Recess allows the students to learn gross motor skills such as running, kicking, climbing, and swinging as well as organized games that teach taking turns, sharing, and physical activity. The afternoon Pre-K schedule is just as busy as the morning. When the students return from recess, they have story time, math and science centers, art, quiet time, and snack. They end their day with a review. The state guidelines require the Pre-K program to have a minimum of 360 instructional minutes, forty minutes of physical activity, 120 minutes learning centers and thirty minutes of quiet/rest time. “Our teachers have worked diligently to develop a schedule that embraces all the aspects required by the state and allows their experience as kindergarten teachers to guide them while planning to assure these children will have the basic skills needed to be ready for kindergarten,” Russell said. “Our goal is to assess each student’s ability level and plan individual activities to assure that each student will grow academically this school year,” Stubblefield said. Pre-K students are also required to take the Kindergarten Readiness Assessment state test. along with kindergarten students. “These results will give us a better understanding of where each student is academically and allow us to plan accordingly,” Topper stated. Stubblefield and Topper plan to meet with the parents/guardians to explain the expectations for Pre-K students and make sure they are equipped at home to help their child achieve these expectations. The Pre-K program at NAES has a very strong team working to continually improve the program and meet the new requirements set forth by MDE. Teachers, administrators and staff are looking forward to a great school year with our youngest students and seeing the children blossom into successful students who are prepared for kindergarten and beyond. Students enrolling in Pre-K must be 4 years old on or before September 1, of the school year, and must have the following information: Birth Certificate, Social Security Card, and Immunization Record (Form #121). Immunization Records should be marked “complete for school” or list a temporary compliance date. A deposit is due at the time of registration and will be applied toward first month’s dues. For additional information, contact NAES at 662-534-1840. Resource parenting: Do you have what it takes?